Herod 1. Herod the Great. Born some time around 70BC. The name means "Hero's Song" from the words Hero & Ode. His father was Antipater governor of Idumaea, the land of Edom / Esau, south of Judaea. His mother was Cypros, a Nabataean (Arabian) noblewoman, a descendant of Ishmael. According to Josephus, Antipater's family converted to Judaism during the forced conversions by Sadducee-influenced High Priest and Jewish leader John Hyrcanus who ruled semi-autonomously from 134-104BC. Sadducees — very big on living in the "here and now", being "righteous" — locking in to the written Torah (Law). He had threatened that any Idumaean who wished to maintain their land would need to be circumcised and enter into the traditions of the Jews. John Hyrcanus's eldest son Aristobulus then established his nation as a monarchy, reigning just one year in 104BC, and was succeeded by his brother Alexander, who reigned 103-76BC. Antipater now became a high ranking official and adviser to Alexander's eldest son, future king and high priest Hyrcanus II. Hyrcanus was a Pharisee in his worldview (Pharisees — very big on living as "the separated ones", being "spiritual" — looking forward to the coming resurrection) due to his mother Salome's influence - as widow queen, Salome lived nine years after her husband's death, reigning from 76-67BC - but the army preferred the younger brother Aristobulus II (a Sadducee, the same as his father). So, three months after Hyrcanus succeeded his mother in 67BC, he was attacked by his brother, and surrendered, and at the time agreed to retire from public life. However Antipater, fearing this loss of influence, took Hyrcanus into an alliance with Aretas III, king of the Nabataeans who at that time occupied the Sinai and much of the land east of the Jordan. As war developed between the two brothers, in 63BC the Roman general Pompey invaded Jerusalem, captured it and enforced peace. Aristobulus's followers had been unwilling to open the gates of Jerusalem, and the city and temple were badly damaged. Twelve thousand Jews were killed, according to Josephus this was mainly by their own countrymen. Also according to Josephus, "But there was nothing that affected the nation so much, in the calamities they were then under, as that their holy place ... should be laid open to strangers, for Pompey and those that were about him went into the temple itself into which it was not lawful for any to enter but the high priest (and the priests - Editor) and saw what was reposited therein, the candlestick with its lamps, and the table (of showbread), and the pouring vessels (for drink offerings and for sprinkling blood), and the censers (pans to carry coals for incense burning), all made entirely of gold, as also a great quantity of (perfumed) spices heaped together, with two thousand talents (each talent weighing about 60 kilograms) of sacred money. Yet he did not touch that money nor any thing else that was there reposited, but he commanded the ministers about the temple the very next day after he had taken it, to cleanse it and to perform their accustomed sacrifices." Aristobulus II was then taken captive to Rome. Pompey appointed Hyrcanus as high priest and Antipater was put in charge of affairs of state. Following an incursion by Alexander, a son of Aristobulus II, Gabinius was sent by Pompey as proconsul to Syria. Upon his arrival in 57BC he suppressed these revolts and abolished Judaea's single monarchy system. He divided the nation into five parts, setting up Aristocratic councils (sanhedrins) at Jerusalem, Jericho, Amathus, Sepphoris in Galilee and Gadara in the north-east. He also rebuilt several towns. In 48BC, during the Roman civil war between Julius Caesar and Pompey, Pompey was treacherously killed by Ptolemy XIII in Egypt. A civil war was then also raging between Ptolemy and his older sister and wife Cleopatra, and Ptolemy's advisers encouraged him to kill Pompey in order to obtain Caesar's assistance. However, Julius Caesar was disgusted at the dishonour done to a fellow Roman, in fact his son-in-law though his daughter had since died, and he took Cleopatra's side. Antipater now brought him 3000 armed Jews in reinforcements. After the victory in Alexandria, Caesar appointed Antipater chief of state in Judaea with the right to collect taxes. At this time, Antipater appointed his son Herod Governor of Galilee. In the politics of Caesar's assassination involving Cassius in 44BC, Antipater took charge of raising a large sum of tax on Cassius's behalf and was poisoned by a Jewish collector in 43BC. Herod executed the murderer, convinced Mark Antony and Octavian that his father had been forced to assist Caesar's murderers and was appointed ruler of Galilee. He was betrothed to a young girl, Mariamne, whose mother was Alexandra daughter of Hyrcanus, and whose father was Alexander her mother's cousin, the previously mentioned son of Aristobulus II. Jewish priesthood and royalty on both sides. In order to marry her, Herod now banished his first wife, Doris, along with their son, Antipater. But he fled to Rome when Antigonus, another son of Aristobulus, invaded Judaea with a Parthian army from the east. Antigonus now mutilated his uncle Hyrcanus, making him unfit for priesthood and banished him to Babylon, naming himself king and high priest in his place. Meanwhile in Rome, Herod was declared to be king by Mark Antony and Octavian around 37 BC. Roman legions from Mark Antony now came to assist Herod's army as they arrived back in Judaea. In the spring of 36 BC, Herod married Mariamne, then took Jerusalem that summer. Josephus declared this to be 27 years to the day from Pompey's taking of Jerusalem. Antigonus was captured and sent to Antony in Antioch for execution which occurred about 35 BC. Hyrcanus now returned in honour, and was made president of the state council. Mariamne, with the strong influence of her mother, insisted that her teenage brother, Aristobulus III, become high priest about 33BC. But within the year, he was drowned, apparently under Herod's orders and Alexandra appealed for justice to Cleopatra in Egypt. Mark Antony called Herod to trial. Though Herod was freed a major rift developed between him and Mariamne. They had two sons, Aristobulus IV and Alexander, and two daughters. In September 31BC, it was the seventh year of Herod's reign according to Josephus. The sea battle of Actium was now fought between Octavian and his general Agrippa against Mark Antony. Antony had taken Cleopatra's side, favouring her son by Julius Caesar as "King of the Kings" over Octavian. Antony was defeated and committed suicide the following year when his troops defected in large numbers to Octavian. Octavian, who was about to receive the title of Augustus, now summoned Herod to a meeting. In some apprehension, Herod came. But Octavian, seeking to establish the Pax Romana confirmed Herod in his kingdom, granting him the region around Jericho which Cleopatra had detached. Herod received in addition, a number of Greek cities. Click here for a decree made by Augustus Caesar about 1 BC, that, in response to Hyrcanus and other Jewish leaders having expressed their gratitude historically towards the Roman peoples, his respect was now being accorded to them for their Jewish customs, their holy days, and their "highest god". However at that time, Mariamne's grandfather/great uncle Hyrcanus was accused of plotting with the Nabateans against Herod and was executed. Mariamne was then accused of plotting to kill Herod by Herod's sister Salome. She was found guilty and, to Herod's sorrow, was executed in 29BC. Her mother, Alexandra, declared Herod mentally unfit and herself Queen. She was executed immediately. Herod now married a third time (about 25 BC), to a second lady named Mariamne, known as Mariamne II, installing her father as high priest. They had a son, Philip. Several other marriages then followed. About 20 BC, the first Mariamne's two sons Aristobulus IV and Alexander, now 12 years old, were sent for education in Rome. Herod commenced the massive rebuilding of the damaged Temple — a 46 year project according to the Jews in John 2:20. But he placed at the entrance to the temple a huge Roman eagle, generating widespread resentment at this emblem of idolatry and oppression. He also built the city Caesarea (Maritima) on the coast. About 12 BC, both sons returned from Rome. Aristobulus married his cousin Berenice, daughter of Herod's sister Salome. They had a number of children including Herodias and Herod Agrippa I. About 10BC, Herod made his first-born son Antipater (his son with Doris) first heir in his will. A major rivalry accordingly developed between Antipater and his half-brothers, Aristobulus IV and Alexander. About 4BC both Aristobulus and Alexander were accused of plotting to kill their father, and were executed for treason. Antipater was also implicated in a plot to murder him in a scheme involving Herod's third wife, Mariamne II. Herod had Antipater arrested, replacing him in the succession with Herod Antipas. He divorced Mariamne and removed her father, Simon, as high priest. Her son Herod Philip I who was about to have an arranged marriage with his young niece, Herodias, was also removed from the line of succession. In his last years, Herod apparently suffered from chronic kidney failure and gangrene in his private organs. As he now grew increasingly unwell, close to death, a group of 40 Jewish students, encouraged by two teachers, smashed the golden eagle at the entrance to the temple. Passionately angry, Herod had them hunted down, dragged in chains to his residence in Jericho, and burned alive. It would have been about the same time that we see the perceived mocking of him by the wise men, their not returning to reveal the whereabouts of Jesus, which of course was followed by the baby massacre in Bethlehem, as recorded in Matthew 2. Incidentally, due to events recorded below, it was probably in early February in 1 BC that this bit occurred, the visit of the wise men to Jesus's "temporary" house in Bethlehem, followed by Joseph and Mary's hurried escape to Egypt. It would have come shortly after the dedication of baby Jesus in Jerusalem which happened in late January, as recorded in Luke 2:22. Note also, Luke chooses not to record the visit of the wise men, nor the brief, perhaps 2-3 month sojourn in Egypt, but that's fair enough, Luke's gospel is designed to reveal Jesus more as "Son of Man", Matthew's emphasis covers more his role as "Coming King". Now, back to Herod. At this time, he appointed Herod Archelaus to be his heir in place of Herod Antipas, had his imprisoned first born son Antipater executed, and died himself just four days later (just before the Spring Passover in 1 BC). According to Josephus, it was his 37th year, and 34 years from the execution of Antigonus. Nation now became a tetrarchy (leadership of four people) - Herod Archelaus initially ruling Judaea Samaria and Idumaea, Herod Antipas ruling Galilee (in the north) and Peraea (an eastern strip along the Jordan River valley), Herod Philip II ruling Trachonitis and Ituraea (further north) and Lysanias ruling Abilene in the far north. Click here for map. 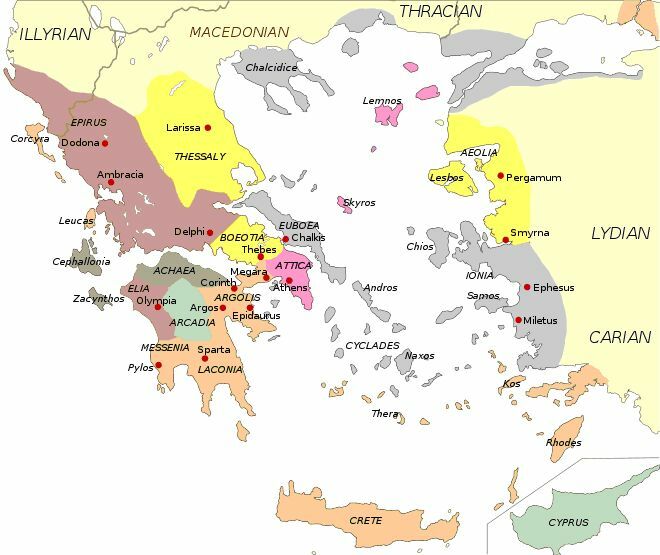 Click here re Decapolis, ten independent cities east and north of Peraea. They had been given freedom including the rights to their own coinage. Herod 2. Herod Philip I or simply Philip. Son of Herod the Great, through his third wife Mariamne II, daughter of Simon the high priest. Married Herodias, the daughter of his half-brother Aristobulus IV (now deceased) and of their mutual cousin Berenice (daughter of their father's sister, Salome). He now moved to Rome, along with this mother-in-law and cousin, Berenice. In 14AD, Philip and Herodias have a daughter, whom they also name Salome. Then, at some point Herodias divorced Philip and, while Philip was still alive, married his brother Herod Antipas. Herod 3. Herod Archelaus. Son of Herod the Great, through his fourth wife Malthace a Samaritan. Born about 23BC. Educated in Rome. Following Herod the Great's last pronouncement, he was proclaimed king of Judaea, Idumaea and Samaria by his army with much celebration. When an opposing crowd of Pharisees began calling for the punishment of those executioners, (the ones who had executed those 2 teachers and 40 youths who had smashed the golden eagle), and this opposing crowd then stoning soldiers sent to reason with them, Archelaus called for a massacre. It was after midnight, and he ordered his entire army into the city to the Temple. Josephus records the death toll at 3000, and Archelaus sent heralds around the city announcing that that Passover was now cancelled. It would have been at the time when Joseph, Mary and Jesus were in Egypt. Next, in Rome, and despite Herod Antipas's objections, Herod Archelaus was approved to be, not king, but ethnarch - i.e. National Leader - by Augustus. More than 2000 Jews were crucified by the Syrian governor when they rioted while Archelaus was in Rome. Further unrest came when Archelaus divorced his first wife and married his half brother (now deceased) Alexander's recently remarried wife. Although, yes, she had remarried she now divorced this husband so Archelaus could marry her, both betraying their vows. She shortly afterwards died and Archelaus was in 6AD deposed by Augustus and banished to Vienne in Gaul. Judaea now came under a Roman prefect, Coponius, with provincial governor, Quirinius of Syria, asserting his control with a second official census. Based on the Jewish timeline, 6AD was the year of their 30th Jubilee, coming 1470 years from when the Jews crossed the Jordan with Joshua in 1465BC (there is no year zero). Click here for a list of these first 31 Jubilee Years. The Jubilee was the official year that public Jewish records enabled Jews everywhere to reclaim their land, if it had been sold due to financial hardship. In scripture, Luke records how a first registration had been announced by Caesar Augustus at the time of Christ's birth, prior to this year. Joseph, Mary and Jesus had been in Bethlehem in obedience to that ruling. Now with all the Jews back on their land according to their own tradition, Quirinius conducted a second official census. Judas the Galilean, traditional founder of the nationalist party known as Zealots led a revolt against this registration. Put down by Quirinius. See Luke's reference in Acts 5:37. Herod 4. Herod Antipas. Son of Herod the Great, also through his fourth wife Malthace a Samaritan. Born before 20BC. Educated in Rome. Took the throne of Galilee in the north, and Peraea, an area east of the Jordan River that extended south to Machaerus, a fortified hilltop palace next to the Dead Sea. Divorced his first wife Phasaelis, daughter of Aretas IV, King of the Nabataeans (Arabs). Married Herodias, wife of brother Herod Philip I. Through a rash promise to Herodias's daughter Salome on his birthday, had John the Baptist executed (John had been imprisoned there after condemning the marriage). See Matthew 14. Had Jesus handed over to him in Jerusalem for judgment by Pilate, but handed him back. See Luke 23. Down in Nabataea (Arabia), to avenge the insult offered to his daughter by Herod's adultery with Herodias, Aretas invaded Herod's holdings, seizing the independent city of Damascus. Herod appealed to Emperor Tiberius, who dispatched Vitellius the governor of Syria to attack Aretas. Vitellius mustered his legions and moved southward, stopping in Jerusalem for the passover of 37AD, when news of the emperor Tiberius's death arrived and the invasion of Nabataea was never completed. Herod was accused by his nephew - Herod Agrippa - of plotting against Emperor Caligula in 39AD. Banished with Herodias to Gaul where he died. Herod 5. Herod Philip II - Philip the Tetrarch. Son of Herod the Great through his fifth wife Cleopatra of Jerusalem. Ruled, according to Josephus, from 4BC (apparently co-reigning with his father during the last 3 years of his father's life) until 34AD in Trachonitis and Ituraea - an area in the north. Rebuilt Caesarea Philippi, in Gaulanitis - i.e. the Golan Heights. Married his niece Salome, daughter of his half-brother Herod Philip I and Herodias. Died childless. Herod 6. Herod Agrippa I. Son of Aristobulus. Born about 10BC. Educated in Rome. Established friendships with Caligula and Claudius. Appointed ruler in place of his uncle Herod Antipas in 39AD, then made King of Judaea in 41AD. Recorded in Acts 12 as beheading James, imprisoning Peter, and, when Herod refused to give God the glory for the worship he was receiving from the people of Tyre and Sidon, dying of worms in 44AD. Herod 7. Herod Agrippa II. Son of Agrippa I. Born about 27AD. Grew up in Rome. 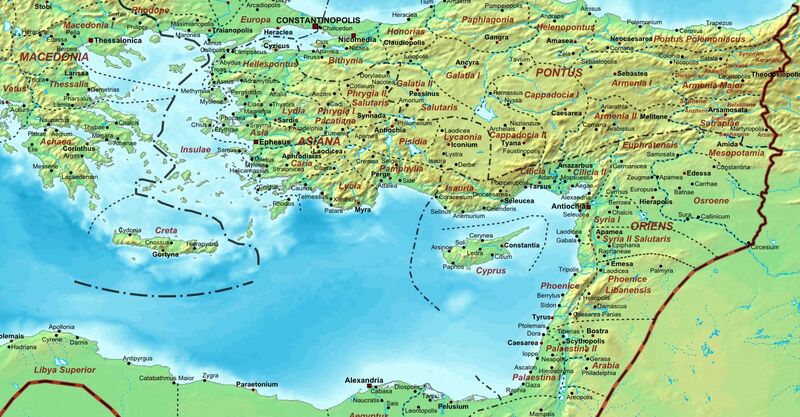 Received the small kingdom of Chalcis/Chalkis (in northern Syria) which included oversight over the Jewish Temple in 48AD following the death of his uncle. In 53AD he was deprived of this kingdom, but appointed governor of the tetrarchy of Philip and Lysanias in the north. 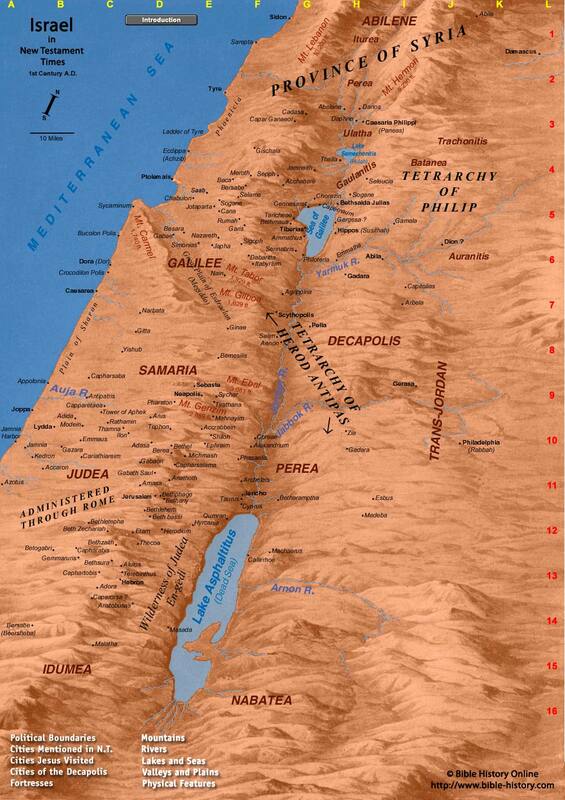 Two years later Nero added the city of Tiberias in Galilee and other villages. His sister Drusilla had married Felix, the Roman governor, who had imprisoned Paul for two years. Now, before Agrippa and his other sister Berenice, and the new Roman governor Festus in 59AD, Paul made his defence at Caesarea (Maritima - not Philippi) in Acts 26. "King Agrippa, do you believe the prophets? I know that you believe". Then Agrippa said to Paul, "Almost you persuade me to be a Christian". Later, Agrippa sent troops to support Rome in the Jewish-Roman war that culminated in the fall of Jerusalem in 70AD. He lived on terms of intimacy with the historian Josephus, supplying him with information for his history, "Antiquities of the Jews". Died in Rome, perhaps about 100AD. 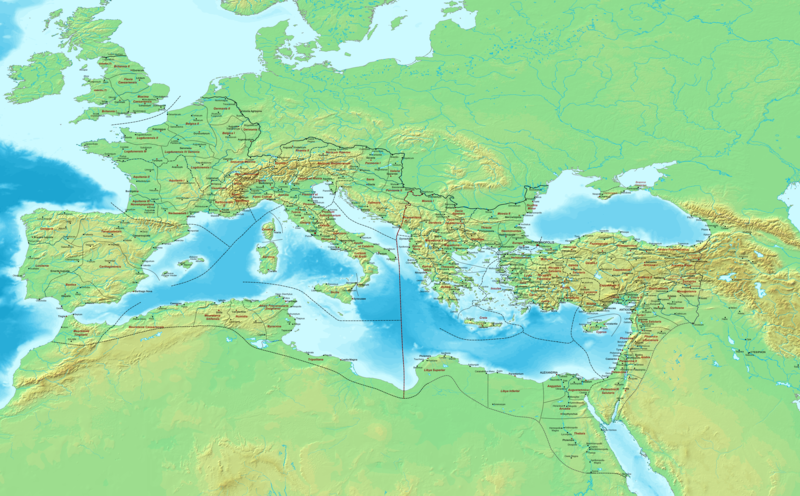 Click here for a full map of the Roman Empire. Note - takes a little while to download. Click an area to see all cities and provinces. Click here for an account of Constantine, who set up his capital at Constantinople in 324 AD. Click here for a history of Jerusalem since 70 AD.